Next Public running Sunday May 19th approx 13:30 until approx 17:00. Usually, during the winter we do not run trains but take the opportunity to do repairs and improvements. You can see our activities by following this link to Winter Works. We look forward to your visit to the KDMES. 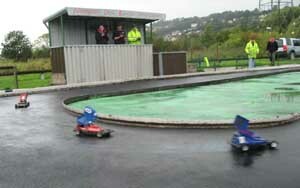 You will find our railway track on the Marley Sports ground in Keighley, just off the A650 dual carriageway. We have free parking situated behind the club house. Click here for map/directions. Our trains are hauled by electric or real steam locomotives. The engines are capable of hauling adult passengers as well as children on coaches that are designed so that you sit astride the track. This saves the strain on the driver's back. The railway track is approximately 400m in an oval shape. One journey is usually twice round. 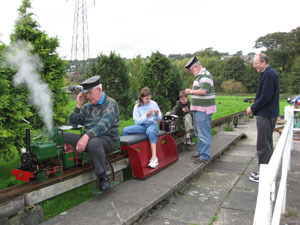 There is a viewing area where you can watch the locomotives being prepared and a seating area between the station and the club house. Refreshments are available to purchase in the club house. Next Public running Sunday May 19th approx 13:30 until approx 17:00. See you there. When the trains are not running we spend our time repairing the track or doing other jobs around the site. To see what we are up to vist the Winter Working page. 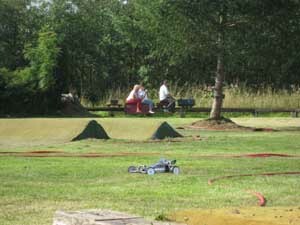 Inside the railway track there is also a circuit for racing model cars and a grass track for model electric buggies. 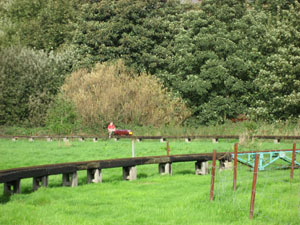 Visitors to the railway track are welcome to cross the line by the footbridge to watch the races. The track and clubhouse is available for hire for private events.Information about birthday parties on our events page. This page was last updated on Tuesday 9th April 2019 at 18:00.